The SOF Combat Assault Rifle, or SCAR, is a modular rifle made by Fabrique Nationale de Herstal (FNH) for the U.S. Special Operations Command (SOCOM) to satisfy the requirements of the SCAR competition. This family of rifles consist of two main types. The SCAR-L, for light, is chambered in the 5.56x45mm NATO cartridge and the SCAR-H, for heavy, fires 7.62x51mm NATO ammunition. Both are available in further variants such as sniper or CQC (Close Quarters Combat). 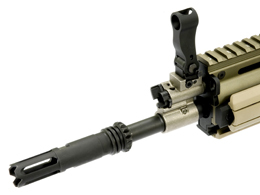 The SCAR is available in two calibers, and in versions for short and long range combat. 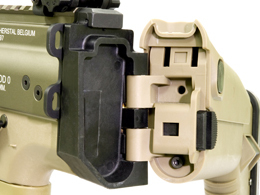 It emerged as the winner of a US SOCOM competition to find a new rifle for special forces begun in 2003. Other competitors included entries by Colt and the Robinson Arms XCR. Heckler＆Koch had submitted the XM8 as a general issue replacement for the M4 and M16 for the US Army, but the program was canceled. 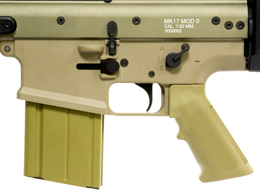 The SCAR is manufactured in two main versions; Light (SCAR-L, Mk 16 Mod 0) and Heavy (SCAR-H, Mk 17 Mod 0). 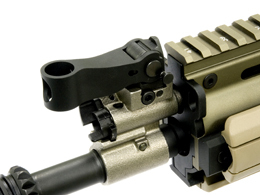 The L version fires 5.56x45mm NATO using improved M16 rifle magazines. The H fires the more powerful 7.62x51mm NATO from a newly designed 20-round magazine. Different length barrels will be available for close quarters battle and for longer-range engagements. The SCAR-L can also be chambered for the 6.8 mm Remington SPC cartridge, and the initial solicitation indicated that the SCAR-H would also be chambered for the 7.62x39mm M43 cartridge. However, FN is not currently offering those calibers. The Mk 16 Mod 0 will be replacing the M4A1, the Mk 18 Close Quarters Battle Rifle (CQBR) and the Mk 12 SPR currently in SOCOM service. 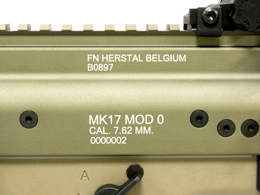 The Mk 17 Mod 0 will replace the M14 and Mk 11 sniper rifles. The 3rd Generation FN SCAR-H, or Mk 17 Mod 0.The SCAR features an integral, uninterrupted Picatinny rail on the top of the aluminum receiver, two removable side rails and a bottom one that can mount any MIL-STD-1913 compliant accessories. 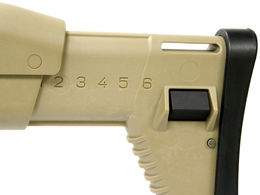 It has a polymer lower receiver with an M16 compatible pistol grip, flared magazine well, and raised area around magazine and bolt release buttons. 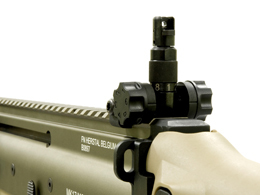 The front sight flips down for unobstructed use of optics and accessories. The rifle uses a 'tappet' type of closed gas system much like the M1 Carbine while the bolt carrier otherwise resembles the Stoner 63 or Heckler＆Koch G36. 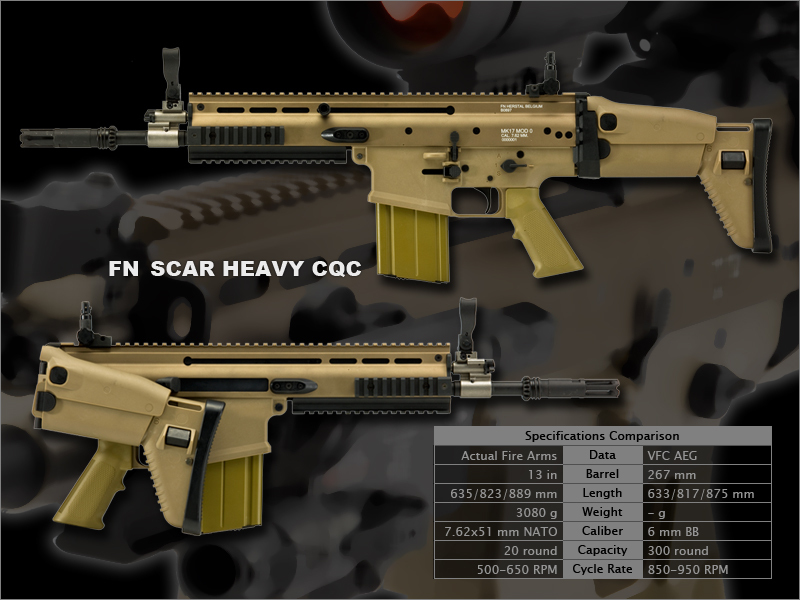 The SCAR will be built at the FN Manufacturing LLC, plant in Columbia, South Carolina. 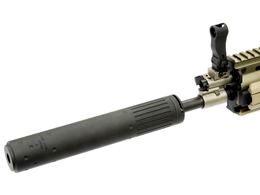 Fabrique Nationale announced plans to introduce (around 2008) a semi-automatic version of the SCAR modular rifle system, designed for the law enforcement and commercial markets. In July 2007, the US Army announced a limited competition between the M4 carbine, FN SCAR, HK416, and the previously-shelved HK XM8. Ten examples of each of the four competitors will be involved. Each weapon will fire 6,000 rounds in an "extreme dust environment." The purpose of the shootoff is for assessing future needs, not to select a replacement for the M4. During the test, the SCAR suffered 226 stoppages ranking second to the XM8 with 127 stoppages and 11 major ones, but less compared to the M4 with 882 stoppages and the HK 416 with 233. This test was identical to two previous systems assessments that were conducted using the M4 carbine and M16 rifle at Aberdeen in 2006 and the summer of 2007 before the third limited competition in the fall of 2007. Results from the second test resulted in a total of 307 stoppages for the M4 after lubrication was increased, but did not explain why the M4 suffered 882 stoppages with that same level of lubrication in the third test. Because of this disparity in results the validity of the test has been called into question but no plans for a retest with a larger pool sample or different test have been announced. ・This page was last modified 13:36, 22 January 2008.